Find San Antonio charter bus pricing, pictures, and info online in seconds!CharterBusAmerica.com is bringing convenient online charter bus rentals reservations to the United States one city at a time. Get San Antonio charter bus rental rates in seconds and compare pictures and bus travel company information all online. San Antonio, the 8th largest city in the nation, is the heart of the Tex-Mex culture and has all sorts of attractions to offer visitors. Charter bus rentals are the right choice when you are transporting a large group of people. No more worrying about who will be late or who will get lost! Charter bus travel means that you can leave the driving to us and enjoy the journey as much as the destination. San Antonio is a wonderful place to plan your next corporate conference or management retreat. Charter bus rentals are a great option for organization events such as senior bus travel outings or team-sponsored travel. We make charter bus rentals easy for the San Antonio group or for travel to San Antonio. Just click on “Request a Quote” and you will be on your way to planning your next group outing! 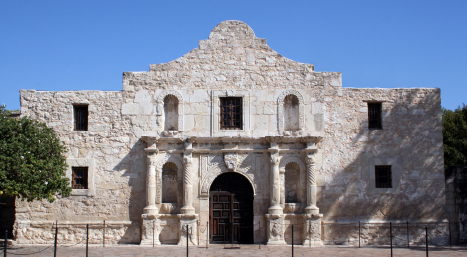 The Alamo is the most visited attraction in the state of Texas. It is full of history and is a must for your charter bus rental adventure.This is probably the most famous landmark in Texas history. The Alamo is where 189 defenders held some 4,000 Mexican troops for 13 days. The battle was a key to the Texan revolution against Mexico. The ancient mission still stands in excellent preserved condition in downtown San Antonio. View the numerous exhibits on your own time or take a guided tour. Thousands of students visit the Alamo every year via San Antonio charter bus rentals. You can find more info on Texas history exhibits at the San Antonio CVB website. One of the most popular destinations in San Antonio is the River Walk located in the heart of downtown. Paths on either side of the river follow it as it winds throughout restaurants, parks, shops, and bars. There are even boat tours with guides who educate visitors about all things Texas and San Antonio. There are several entry points to the River Walk, but your San Antonio charter bus company will know where to drop you off and pick you up. SeaWorld is a fun place to take the kids. It is a time to get off of the charter bus, walk around, and watch the animals swim around for hours. Another grand amusement park for kids and adults alike to blow off steam is theFiesta Texas Amusement Park. From roller coasters to water slides you'll have a hard time doing it all. Save yourself the trouble of parking and check into San Antonio charter bus rentals to drop you off at the gates. Market Squareis the largest Mexican marketplace outside of Mexico. Here you'll find all the best restaurants as well as shops. It's a great environment to really soak in the Tex-Mex culture. Parking can be difficult which is why many groups will arrive via a San Antonio charter bus which conveniently drops them off and picks them up when they are ready. For even more ideas, visit out fun things to do page for Texas! Like any large city there are really too many bars and clubs to list in one place. 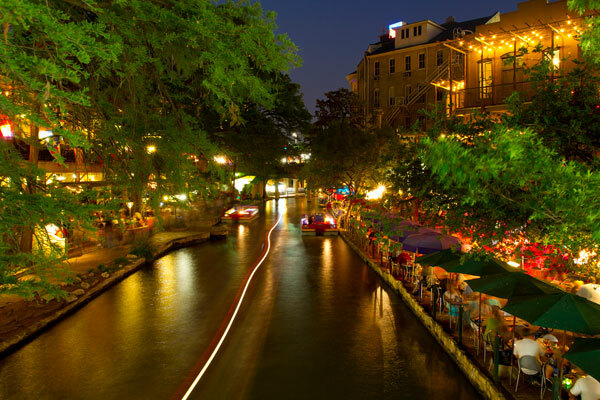 You can definitely get your fill and variety of nightlife all around the River Walk area in downtown San Antonio. 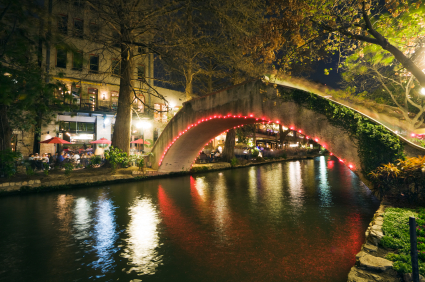 With a network of numerous walkways along the bank of the San Antonio River, it is the perfect stop for your charter bus travel group. What are you going to eat in San Antonio? Mexican of course! The city is the hub of Tex-Mex cuisine. Charter bus travel allows scheduling stops to take your group to some of the best restaurants and environments located together at Market Square. Tired of Mexican? No problem. San Antonio has every variety of cuisine known to man. Zocca Cuisined' Italia can also be found along the River Walk. Diners can eat inside or outside on the patio. Vegetarian and gluten-free food is also available for those in your charter bus travel group with specific dietary needs. The Cove is locally owned restaurant and beer garden. American cuisine and family friendly environment make this an ideal stop for your charter bus group. Twin Sisters Bakery & Café is run by a pair of twin sisters. They offer healthy breakfasts, lunches, and dinners in homemade style. San Antonio Spurs - Basketball is the main option as far as professional sports go in San Antonio, Texas. The Spurs play at the Alamodome located in central San Antonio, TX. Groups come by the tens of thousands each year and save themselves the hassle of parking by choosing charter bus travel. When renting your charter bus, please remember to check the team’s schedule of games to make sure that you and they will be in town at the same time. Poteet Strawberry Festival is all about strawberries and includes fun activities like rodeos, dancing, concerts, rides, and more strawberries. San Antonio Summer Art & Jazz Festival happens in June each year and lasts for three days. It is free to locals and visitors alike. Be sure and visit so your whole tour group can enjoy the music, food, and arts and crafts. Bus travel options can include traveling to San Antonio as well as surrounding Texas cities. Charter bus travel means your group can take in more than one destination with planned stops along the way. Austin is fun to visit for tours of the State Capitol and the LBJ Library & Museum. If you are a history buff, then these two stops should be on your charter bus itinerary. Corpus Christi is on the coast so you can have some fun on the beach. Be sure to visit the USS Lexington Museum on the bay while on your charter bus tour. Houston is the largest city in Texas and offers a lot of variety for visitors. The SplashTown Waterpark Houston is a great place to go if your bus travel brings you to town during the heat of the summer. San Antonio has access to numerous Interstates, U.S. Highways, and State Loops and Highways. Interstates 10, 35, 37, and 410 are the main Interstates in the area. With so many roads to choose from, designing your charter bus travel route will be fun knowing that you can see as much of San Antonio and surrounding cities as you want. In summary, San Antonio has everything any large city has but also offers a focus on Texas history and Mexican culture and cuisine. Now it's time to plug your itinerary into the quote form to get a San Antonio charter bus rental estimate. You can even compare San Antonio charter bus company pictures and information so you can make an educated purchase for your next charter bus rental.